Cost: $30 in advance, $25 for members of CMS or WCCMA by the 9th. $35 after February 9th. 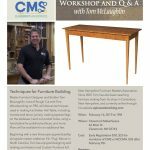 The West Claremont Center for Music and the Arts and the Claremont Maker Space are pleased to welcome master woodworker Tom McLaughlin to Claremont for this special program. 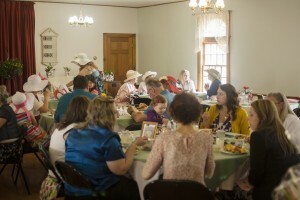 Participants will learn the techniques used to build the Shaker Hall Table designed by Tom. These tips and tricks will be valuable for other projects as well. Full size, hand drawn plans will be available to purchase for an additional fee (cash or check). At the end of the program the audience will be invited to ask questions. Beginning with a rare three-year apprenticeship alongside master craftsman P.A. “Pug” Moore in North Carolina, Tom has enjoyed designing and making commission and Custom Furniture full-time since 1990. His designs have received recognition and numerous awards during his twenty-year membership with the prestigious New Hampshire Furniture Masters Association. Since 2001 Tom has also been teaching furniture making from his shop in Canterbury New Hampshire, and currently online through his website epicwoodworking.com . Most recently he has been featured as host of the public television’s Rough Cut with Fine Woodworking. 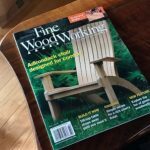 He has also written for Fine Woodworking magazine, and the Adirondack chair he designed is on the cover of the current issue.